Megan Jones became a painted lady to promote the upcoming International three day event in Australia. Click on the photo to enlarge it. I’m not sure that it would be comfortable, but this sure makes you look twice! 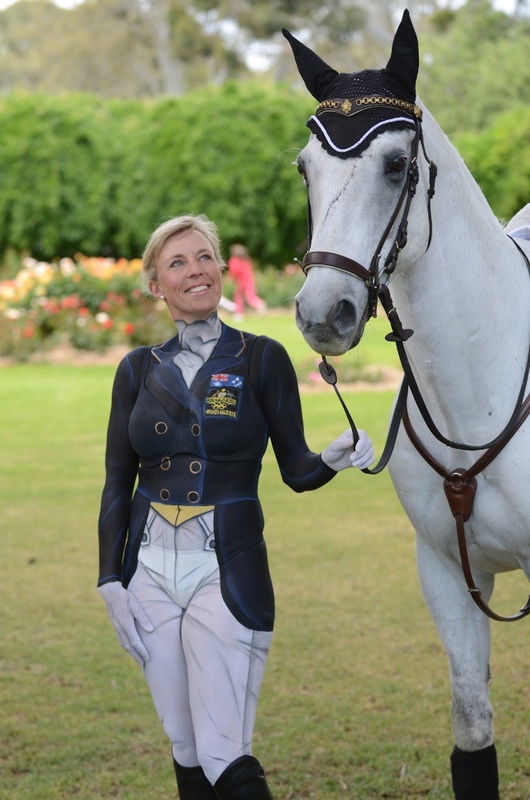 To promote the upcoming Australian International Three-Day Event, Olympic silver medalist Megan Jones has been pictured riding her Olympic horse in an unusual outfit — her shadbelly and breeches are more painted on! It took six hours to apply the make up. The publicity stunt follows last year’s painting of Laura Collet’s horse, Natterjack, who became “Union Jack” to promote the Barbury Horse Trials. Personally, I’d let the horse wear the paint, especially as he’s just the right color for it. FYI – for those of you who want to paint their horse (Halloween, anyone?) Natterjack was decorated using liquid Chalk pens. To boot or not to boot?